If you are coming from Johor Bahru and catching a flight from Changi Airport in Singapore, it would be more reliable to get the Shuttle Tebrau across the Causeway as it will eliminate any chance of a traffic jam and fluctuating immigration times at the bus checkpoint. This guide will show you how to get between Woodlands Train Checkpoint and Changi Airport by public transport in the fastest and cheapest way possible. Get on the Shuttle Tebrau for a hassle-free border-crossing journey. Shuttle Tebrau tickets are open for sale 30 days before departure. Click here for more information about the Shuttle Tebrau train service. Get on SMRT Bus Service 178, 903, 911 or 913 from the bus stop outside Woodlands Train Checkpoint to Woodlands Temporary Bus Interchange. You will probably wait a maximum of 10 minutes for one of these buses. 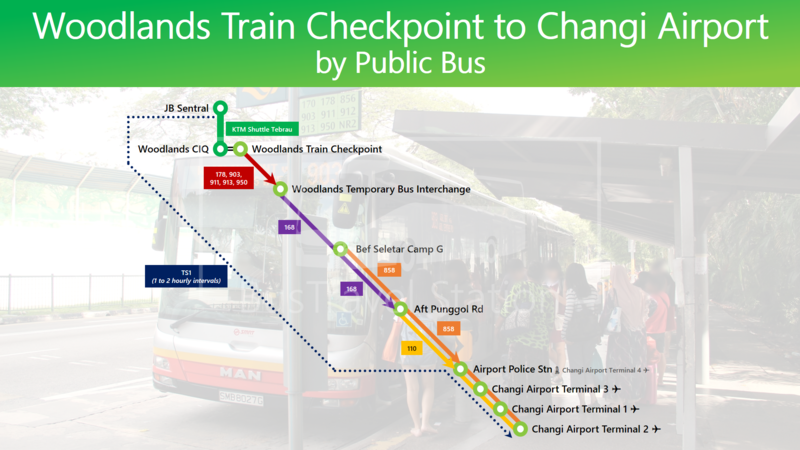 Click here for more options from Woodlands Train Checkpoint to other MRT stations. The ride from Woodlands Train Checkpoint to Woodlands Temporary Bus Interchange will take approximately 25 minutes. Once at Woodlands Temporary Bus Interchange, head to Berth 1 to wait for SBSTransit Bus Service 168. You will experience a wait of 5 to 13 minutes for SBSTransit Bus Service 168. SBSTransit Bus Service 168 will take an express route on the Seletar Expressway (SLE) and Tampines Expressway (TPE). You could get off at the first bus stop after the expressway ride at Jalan Kayu – Bef Seletar Camp G, but you will only have one option by SMRT Bus Service 858 to continue on to Changi Airport. You should get off at the TPE – Aft Punggol Rd bus stop where you can change to SMRT Bus Services 110 or 858 to continue your journey to Changi Airport. The ride from Woodlands Temporary Bus Interchange to TPE – Aft Punggol Rd will take approximately 30 minutes. You could expect a 5 to 10 minute wait for SMRT Bus Service 858 and a 8 to 13 minute wait for SMRT Bus Service 110. However, as you have two parallel route options here, it shouldn’t be too long before you are on your way. SMRT Bus Services 110 or 858 will take an express route on the Tampines Expressway (TPE). The journey from TPE – Aft Punggol Rd to Changi Airport will take about 20 minutes. If you are heading to Changi Airport Terminal 4, you should stop at the first bus stop when turning left to Changi Airport at Airport Blvd – Airport Police Stn. and walk across the overhead bridge for a shorter journey. The walk from this bus stop to Terminal 4 will take approximately 7 to 10 minutes. Walk across the overhead bridge for a shorter journey than heading to Terminal 2 and getting on the Changi Airport Terminal 4 Free Shuttle Bus Service. The walk from this bus stop to Terminal 4 will take approximately 7 to 10 minutes. SMRT Bus Services 110 and 858 will make in-terminal stops at Terminal 3, Terminal 1 and lastly Terminal 2. Pro-tip: If you are heading to Terminal 2, you can also alight at Terminal 3 and walk across the linkbridge above the MRT station instead of continuing on the bus which may potentially take slightly longer. Head inside the terminal to continue on with your flight. Tap your stored value smartcard (EZ-Link or NETS Flashpay) on the reader when you board the bus and tap it again when you alight. Fares are charged based on the total distance travelled. For cash payment, provide exact fare to the bus captain. No change is provided. Hold on to your paper ticket till the end of your ride as proof of fare payment if a ticket inspector were to board the bus. Transtar Cross Border Bus Service TS1 departs every 1 to 2 hours. Personal Suggestion: If you are not a Singapore or Malaysia passport holder, I personally will not suggest taking TS1 from JB Sentral to Changi Airport as in case immigration queues crop up, or you have any other issues at Johor Bahru or Singapore immigration or customs, you may miss the TS1 bus and have to wait for the next bus in 1 to 2 hours time, or if you choose not to wait, you will have to walk out of Woodlands Checkpoint and follow the above steps anyway. At Changi Airport, all buses will make in-terminal stops at Terminal 3, Terminal 1 and Terminal 2, with some serving Terminal 4 as well. Pro-tip: Buses will layover (rest) at Terminal 2, before continuing on with the return journey. As such, if you board the bus at Terminal 2, you can sometimes catch one bus ahead of the one resting, saving you around 10 minutes of your journey time. Take SMRT Bus Services 110 or 858 from Changi Airport to TPE – Bef Punggol Rd bus stop. SMRT Bus Service 110 will make stops at Terminal 3, Terminal 1, Terminal 2 and Terminal 4. SMRT Bus Service 858 will make stops at Terminal 3, Terminal 1 and Terminal 2 only. You could expect a 5 to 10 minute wait for SMRT Bus Service 858 and a 8 to 13 minute wait for SMRT Bus Service 110. However, ff you are coming from Terminal 4, want an option to take both SMRT Bus Services 110 or 858, and save a few cents on your bus fare, you may walk out to Airport Blvd – Near SATS Flight Kitchen bus stop instead. The walk from Terminal 4 to Airport Blvd – Near SATS Flight Kitchen bus stop will take approximately 7 to 10 minutes. Get on either SMRT Bus Services 110 or 858 to TPE – Bef Punggol Rd bus stop. The ride from Changi Airport to TPE – Bef Punggol Rd will take approximately 20 minutes. Get off at the TPE – Bef Punggol Rd bus stop where you can change to SBSTransit Bus Service 168 to continue your journey to Woodlands Temporary Bus Interchange. 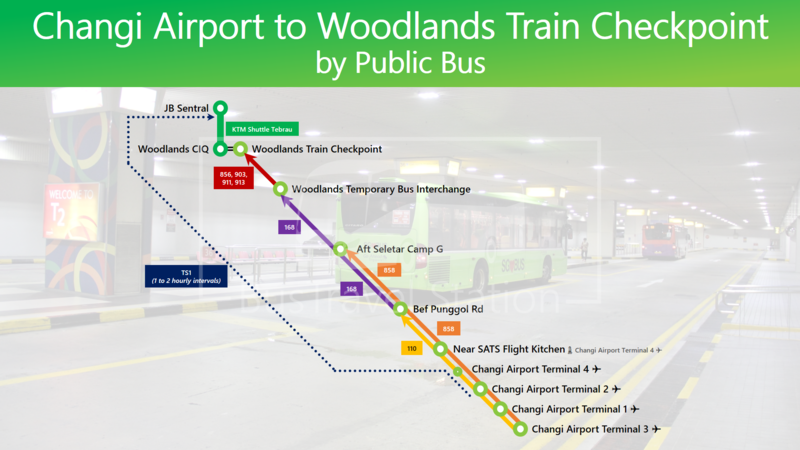 The ride from TPE – Bef Punggol Rd to Woodlands Temporary Bus Interchange will take approximately 30 minutes. Once at Woodlands Temporary Bus Interchange, head to Berth 6 or 7 to wait for SMRT Bus Services 911 or 913 (whichever comes first) for the easiest route to Woodlands Train Checkpoint. Ensure that the queue line specifically states Woodlands Train Checkpoint as there are 2 possible intra-town routes for 911 and 913 departing from different berths. You will experience a 2 to 9 minute wait for either SMRT Bus Services 911 or 913. Click here for more options from other MRT stations to Woodlands Train Checkpoint. The ride from Woodlands Temporary Bus Interchange to Woodlands Train Checkpoint will take approximately 25 minutes. Once at the Woodlands Train Checkpoint bus stop, walk straight along the sheltered path to the KTM counter at Woodlands Train Checkpoint to purchase (if available on the spot) or exchange your online ticket printout for the actual ticket to board the Shuttle Tebrau train service to JB Sentral. Personal Suggestion: If you are looking for a hassle-free journey from Changi Airport directly to JB Sentral, you could use TS1 if you want. However, in case immigration queues crop up, or you have any other issues at Singapore immigration or customs, you may miss the TS1 bus and have to wait for the next bus in 1 to 2 hours time. If such an issue happens, take a public bus from Woodlands Checkpoint to JB Sentral CIQ. Check fares (Singapore Dollar only) at the queue line before boarding the bus. For more information about the calculation of Singapore public transport fares, use the MyTransport.SG Fare Calculator.